Siobhan started swimming at the age of eight and two years later was introduced to competitive swimming by Glen Fowler in Kiama NSW when he entered her into competitions for people with a disability. In 1999 Siobhan was coached by Peter Freney and Les Barclay of Telopea Swimming Club. 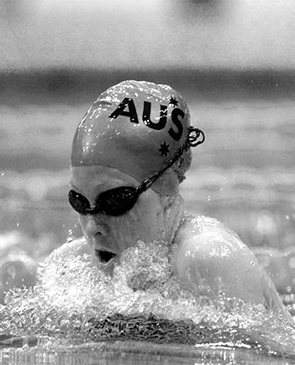 As an Australian Paralympic swimmer and as of 2004, Siobhan still holds thirteen world records in her disability class of S14 - intellectual disability. During her swimming career she broke over 100 World records in her disability class. Siobhan represented Australia at the 2000 Summer Paralympics in Sydney, where she won six gold medals, for which she received a Medal of the Order of Australia, and set world records on nine occasions in the process. In recognition of her achievement, the Australian Paralympic Committee named her “Paralympian of the Year”, and she was honoured on a postage stamp. She was also awarded an Australian Sports Medal before the 2000 games. In 2004, Paton competed in the INAS-FID (International Sports Federation for People with an Intellectual Disability) World Championships, where she won fourteen gold medals and three silver. That same year, she won three gold medals, two silver and two bronze at the Global Games. Paton could not compete in the 2004 or 2008 Paralympics, due to the International Paralympic Committee’s decision to suspend the participation of all athletes with intellectual disabilities. From 2000 to 2002, she held an Australian Institute of Sport scholarship. Her sister Sarah competed in the Women’s 800m Freestyle at the 2004 Summer Olympics.